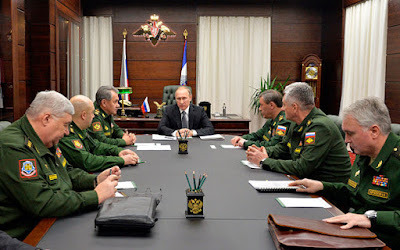 Russian President Vladimir Putin talks to top Russian Army commanders during a Defense Ministry board meeting in Moscow on Friday December 11, 2015. (BLOOMBERG)—President Vladimir Putin ordered defense chiefs to strengthen Russia's strategic nuclear forces amid rising tensions with the U.S. over the global balance of power. New weapons should go to "all parts" of the nuclear triad of air, sea, and land forces, Putin told a Defense Ministry meeting in Moscow on Friday. Action must also be taken "to improve the effectiveness of missile-attack warning systems and aerospace defense." Amid a conflict with NATO member Turkey over the shooting down of a Russian warplane near the Syrian border last month, Putin ordered defense officials to "react harshly" to threats to Russia's forces operating in Syria. Any such threats should face "immediate extermination," he said.